My review copy: I received a copy of this book from the author in exchange for an honest review. Gabby lives by two unbreakable rules: don’t expose her kind, the Sary, and don’t fall in love—too bad some rules are made to be broken. When Gabby’s most difficult charge accidentally shoots her in front of a class full of students, the event exposes her carefully hidden identity. She shifts from looking like a normal teen to her secret Sary form, revealing her wings and the existence of her kind—immortals who try to keep people from committing suicide. Her incident attracts the attention of the next leader of the Sary, Jassen, who offers her an impossible bargain: she can keep her wings if she makes amends with those who know the truth. Things get more complicated when a rebel Sary, intent on exposing them to the world, starts interfering with Gabby’s work. And there’s no denying her attraction to Jassen, who is torn between his duties and his heart. 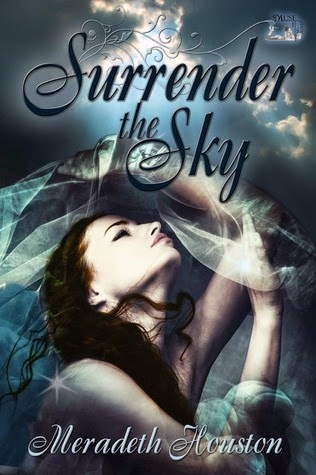 With threats at every turn and her immortality on the line, Gabby has to find a way to save the Sary or surrender the sky forever. You're not going to try and make a run for it? Marcus's words held a smile. We both knew it would be pointless since Sary could be tracked anywhere. We had a GPS in our DNA. No, I can't, can I. It wasn't a question. Would you like to go flying? It helps to clear your head. My wings weighed against my back, tucked around my chair. I peered up at Jassen with hooded eyes. I just want to sleep, so you better be right. She has the ability to help people. She feels the pull of the skies. She is a Sary known to the mortal world as Gabby. Then she makes a HUGE mistake that cost lives and she knows that her wings will be taken away. She is positive of this fact. It is engrained in her from training. The clean up crew with take care of the rest. This is what was supposed to happen but then Jasson the next in line to head up the Sary shows up. This book blew me away with its quick wit, explosive scenes, and the amazing likeability of the characters. The author really knows how to keep the reader on their toes. No secrets were given away and chapter upon chapter just led to more questions. I couldn't put this book down. I read it through the night because I just couldn't handle sleep without knowing how Gabby would get out of her latest predicament. I found this book to be a refreshing change from most "angel type" books and I really believed in the story the author was telling. The author depicted the YA voice perfectly and did not at any point lose her reader in useless information as some authors sometimes do. I gave this book five stars because of so many different things. Qualities that can't be explained but just are. This book won me over, get your copy today so it can do the same to you! She’s a Northern California girl. This generally means she talks too fast and use “like” a lot.When she’s not writing, she’s sequencing dead people’s DNA. For fun!She’s been writing since she was 11 years old. It’s her hobby, her passion, and she’s so happy to get to share her work!If she could have a super-power, it would totally be flying. Which is a little strange, because she’s terrified of heights.